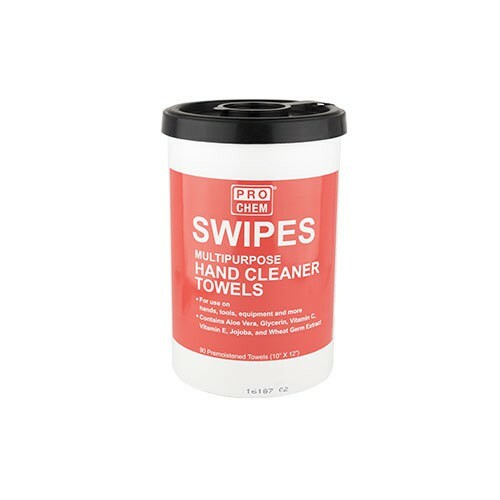 SWIPES | Pro Chem, Inc.
SWIPES hand cleaner is a superior value hand cleaner/towel combination. This combination allows you to cleanup right on the jobsite without water and eliminates the need for paper towels or shop rags. The formula cuts through soils such as grease, paints, tar, oils, lubricants, inks and more. Each towel is fortified not only with heavy-duty cleaners, but also the skin conditioning agents glycerin, jojoba, vitamin E & C, aloe vera and wheat germ extract. SWIPES are also recommended for use in cleaning shop tools. Each self-dispensing canister contains 90 perforated, easy tear towels made of textured polypropylene material that stay moist for hours, allowing multiple uses. 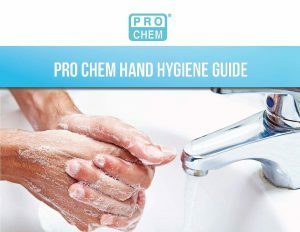 Wipe hands or the surface to be cleaned completely and dispose of the wipe in proper manner.